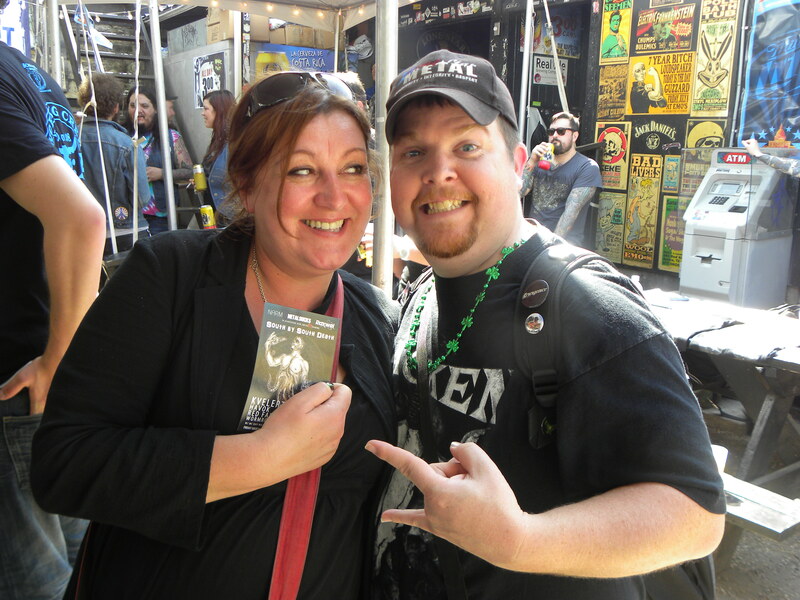 Rusty with Liz Ciavarella-Brenner of Earsplit PR and former editor for Metal Maniacs. Spring Break holds assorted connotations for a variety of people. Some use it as an excuse to indulge in “Jersey Shore” fantasies, and assume a no holds barred attitude on a beach with millions of “wooo” girls and guys. If you get the reference kudos to you! Others find relaxation away from the mundane in a far away place. For music fans, industry types, and numerous musicians, it is a chance to merge together against the backdrop of South by Southwest in Austin, TX. If you are unsure what SXSW is all about, then you simply need to look it up. I cannot describe the enormity of this event. I can say that any genre of music you are into can be found on the streets of downtown Austin for five days. Obviously, we scoured the back alleys of 6th Street and parking lots in between for the best in Heavy Metal that SXSW had to offer. James from Texas Metal Collective bringing the Metal to the masses. 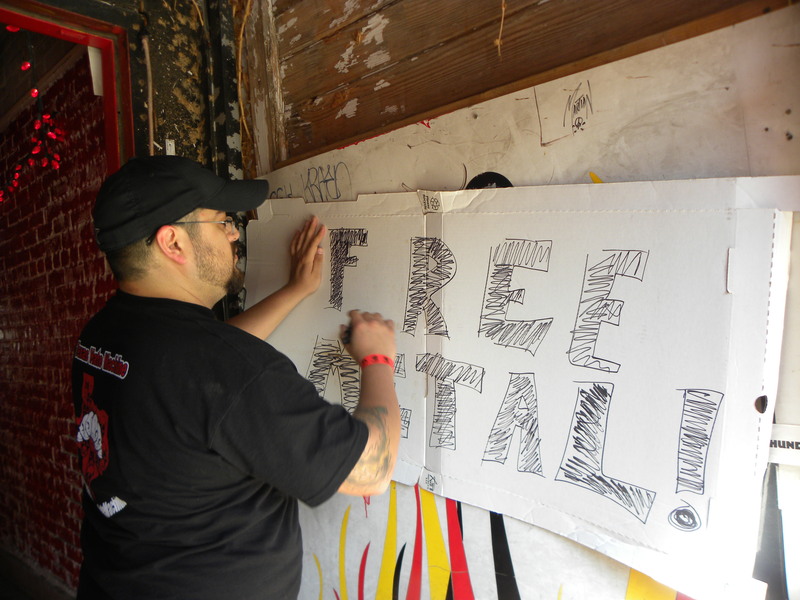 Lone Star Metal called Hoek’s Death Metal Pizza home during the event. Hoek’s is the most unique pizza joint you will encounter. Picture huge slices of pizza served with cold tall boys and nothing but Heavy Metal blasting through the speakers. Texas Metal Collective, an organization that promotes Metal in Austin, also called the pizza joint home, and hosted their Metal fest here for the duration of the week. Not only did they showcase some of the most talented bands Texas has to offer, but also they brought in acts from Sweden to Korea. Bult, from Sweden, definitely solidified their chokehold on the Austin scene through their series of shows at Hoek’s on various days. Each set was solid, powerful and in your face. Apollo 18, from Korea, delivered a set of intense Hard Rock with limitless energy and a passion for the music that is rarely seen portrayed in a live performance. Proudly representing a dual nationality, Texan and Columbian, Headcrusher delivered an onslaught of Metal that can only be described as brutal. These guys won the “Sign Me to Roadrunner” contest for the aforementioned record label, and rightfully so. Good luck to them on this new endeavor. With so many Texas bands on this bill waving the flag for Texas Metal, I will simply say that the Texas Metal Collective showcases made my chest swell up with pride. By Any Means Necessary, Texas Hate Machine, Dead Earth Politics, Brink of Disaster, Killing in Apathy, and tons more told anyone that passed by that Texas Metal is a force poised to take SXSW by the balls. 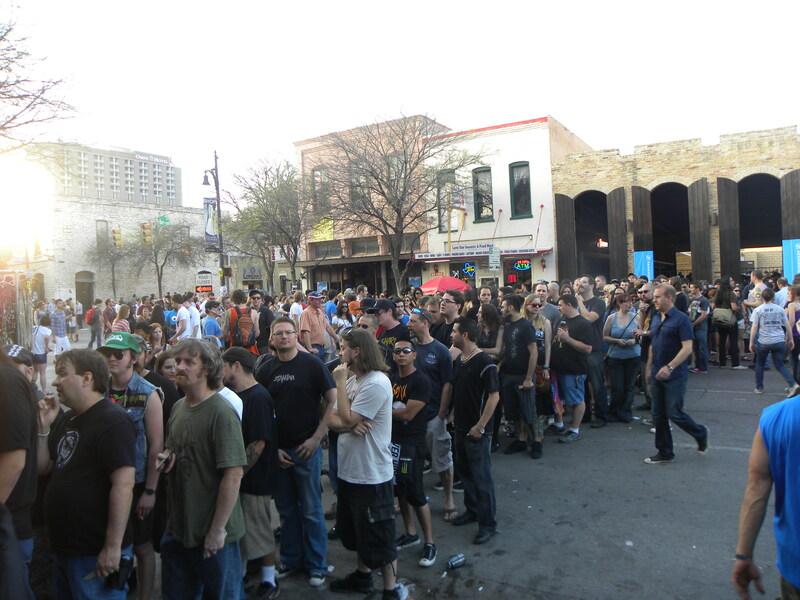 The massive line outside The Dirty Dog Bar waiting to see St. Vitus and Crowbar. As great as the Texas Metal Collective shows were, there was too much other great music to witness. Friday brought the Metalliance tour, featuring St. Vitus, Helmet and Crowbar, which was the gem of SXSW for 2011. St. Vitus, featuring Wino, played my favorite venue on 6th Street, The Dirty Dog Bar. The Doom masters did not disappoint, and delivered a set worthy of the massive line that waited outside the bar in anticipation. The band proved beyond doubt they still bear the crown of a genre they helped pioneer. Along with the veterans, Crowbar brought their own brand of sludge doom that was a great pairing to St. Vitus. I was pumped to see Helmet for the first time, however when the band hit the stage I soon hit the bar. Something was lost in translation from the discs I listened to in high school to the performance I saw. I was honestly bored, however luck brought me my dear friend Miriam from the ICS Wacken team. 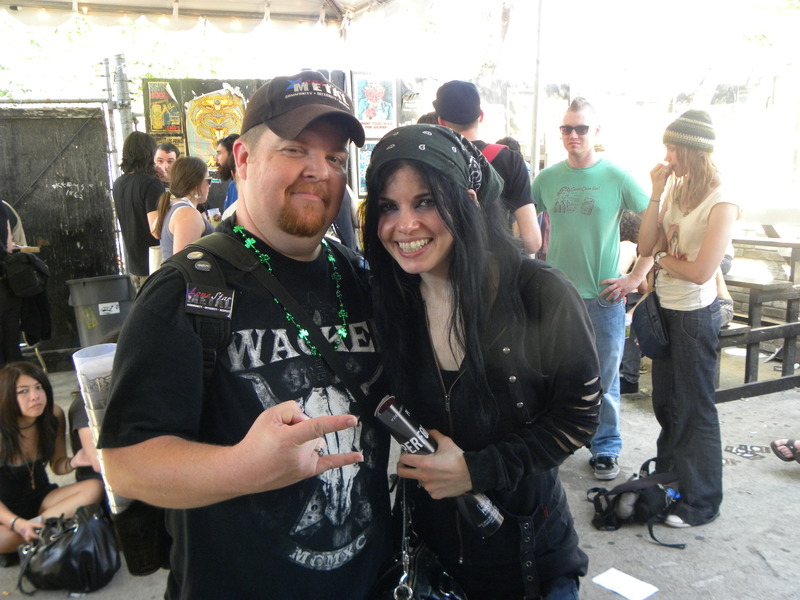 Miriam and I partied at the Wacken sponsored beer garden at Emo’s the day before, and we met the year before when Suidakra slayed SXSW in 2010. Camaraderie such as this is another aspect of SXSW that keeps fans like us coming back year after year. show. According to eyewitness accounts, the show was everything you would expect from these quality bands. Powderburn proved they didn’t need the full stage set up to take command of the stage and Snake Skin Prison set the bar for the performances the rest of the night. I joined the fray during Wellborn Road’s set, their second venture to Austin. These four boys exhibit their love for the music in every performance, and Friday night was no exception. I suppose I should warn any newcomer to SXSW that the shows tend to blur together as well as the days. The reviews and comments to follow happened sometime during SXSW, however the specific day is a bit hazy…damn beer garden! In a club called Barbarella, which was once Encore, I discovered a band called House of Broken Promises from California. This band, although not completely original, brought a show that was tight, raw and blistering with a Southern edge you’d find south of the Mason Dixon line. Coupled with these Californians was Austin’s own Dixie Witch. This three-piece are a refreshing surge of energy into a Rock and Roll vibe straight from the Arena Rock era in the late 70s. Trinidad, JT, and CC deliver a powerful set every time they hit the stage. If you’ve never seen Dixie With, then fix that error as soon as possible. Another set I caught was Admiral of Black playing at The Jackalope. I discovered this band purely on accident, which is one of the great things about SXSW. Rumors were flying that there was free beer at The Jackalope, so naturally we gravitated there. After meeting up with some friends, I heard some great music coming over the speakers. I wondered to myself who they were playing on the CD player, and leaned to my buddy to comment. 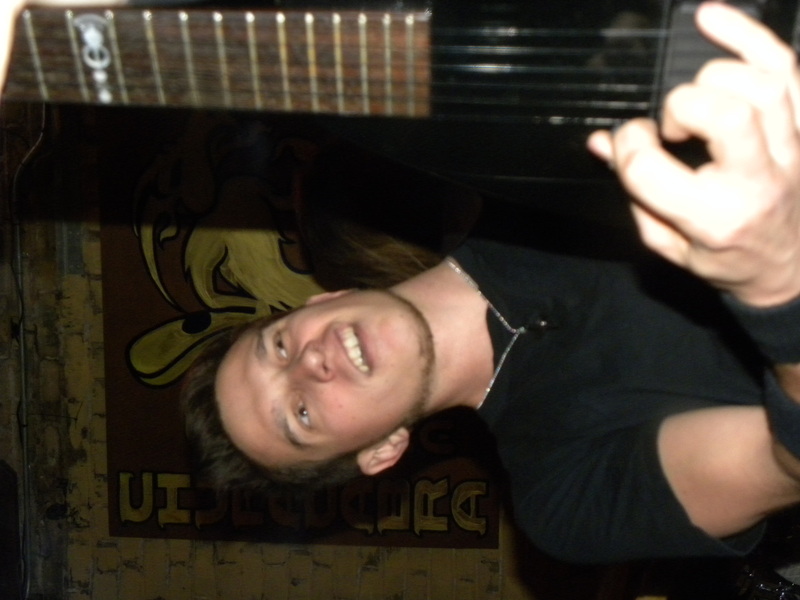 He pointed to a small corner of the bar where I saw a tiny stage containing the band with the huge sound. I squeezed over to find Admiral of Black all the way from Chicago. These guys pounded the walls with a barrage of chords and rhythm that turned heads and had fists pumping. The four-piece blend an early thrash sound with a southern vibe. Although I heard only two songs, I was impressed and they made a lasting impression. Look these guys up for sure. Miriam Hensel of the Wacken group. There are so many things SXSW has to offer. The only way to truly appreciate the event is to attend. I would strongly advise you to have a game plan…even if it’s to walk the streets and listen for great music. Trust me, it will be there.